What does "setting the tone for the new year" mean to you? Are you writing down goals for each month? Are you making vision boards to create the visual for the goals? Are you sharing your goals and ideas for personal development with supportive friends and family? I've been thinking of a master plan all day, striving to get one of the former things done. And though I failed to do so last year, planning + creating the vision with great results in past years prompted me to get the ball rolling again. I pulled out my notebook (you know, the ones we keep that we jot down all our dreams, favorite quotes, and bucket list items in), gathered a stack of magazines, and turned Pandora on. And just like that, I was back in the groove of planning for success! Thumbing through my notebook, I saw some notes from my one word intention for 2014. Thinking of one word to sum up everything I wanted to accomplish for the year was the goal. And since using one word to illustrate my vision served me so well in the past, I knew I had begin this process by doing this same exercise again. And the one word that stood out from all of the others that crossed my mind was INTENTIONAL. Intentional looks like a big word with a simple definition at first glance. When I referenced the dictionary, I saw that the definition of the word intentional is, simply put, "deliberate; done on purpose." But when I looked at the larger scale of things, everything I have my mind set on for the upcoming days, weeks, and months, all have one unified theme-- being intentional. I even looked up synonyms for the word intentional---and I've decided I want to embody all of these words in my journey to improvement: deliberate, conscious, willful, and purposeful. I want to be deliberate with my intentions, my actions, and my words. I want to be more conscious--present and aware of everything I'm involved in, not just going through the motions. I want to be willful in my living, loving, sharing, giving, and learning. I want to my presence to be purposeful. See, I have this habit of doing the most. I like doing so many things---things that make me happy, things that make me smile, things that make others happy, things that I hope are making a difference to someone somewhere... But am I doing these "things" with PURPOSE? Am I being intentional with my time? Or am I just going with the flow, fitting into the groove of what everyone else has going on, hoping to scrape up a little for myself as I go along? Am I completing goals that hold purpose in my life---that align with the vision I have for myself and my family? Better yet, am I being intentional about pursuing a relationship with God and aligning myself with HIS purpose for my life? When I began to ponder on those things, I realized that I haven't been fooling anyone but myself. I've been keeping busy and writing goals I want to accomplish, yet I've been lukewarm in my actions. And I wasn't consulting God or putting Him at the head of my life /my family when pursuing these goals. So in short, I was making myself busy, but not producing the results I needed to deliberately live MY best life. Now I'm ready for change. 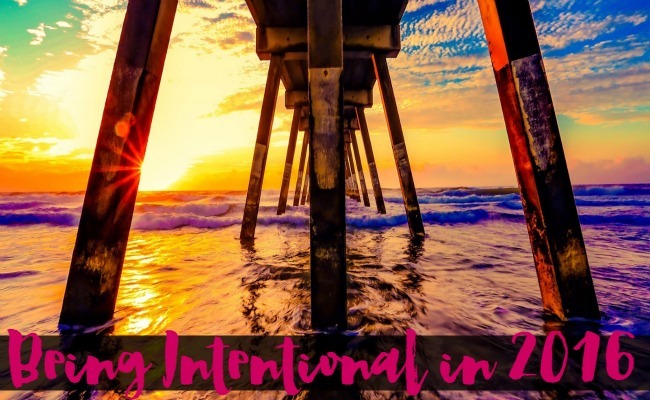 I'm ready to be intentional in ALL areas of my life---not lukewarm in my efforts or just crossing off things on a to-do list that aren't relative to my life's purpose. I'm taking the bull by the horns from this point forward and going after what's mine! What is one thing you'd like to do to improve your life, starting today? And if you have in mind one word that illustrates your intentions and focus for your ideal life, please feel free to share it with me in the comments. I would love to hear from you!